Uniform Electrolytic Copper On Steel Core, Minimum Copper Depth 10 Mils, UL Listed. 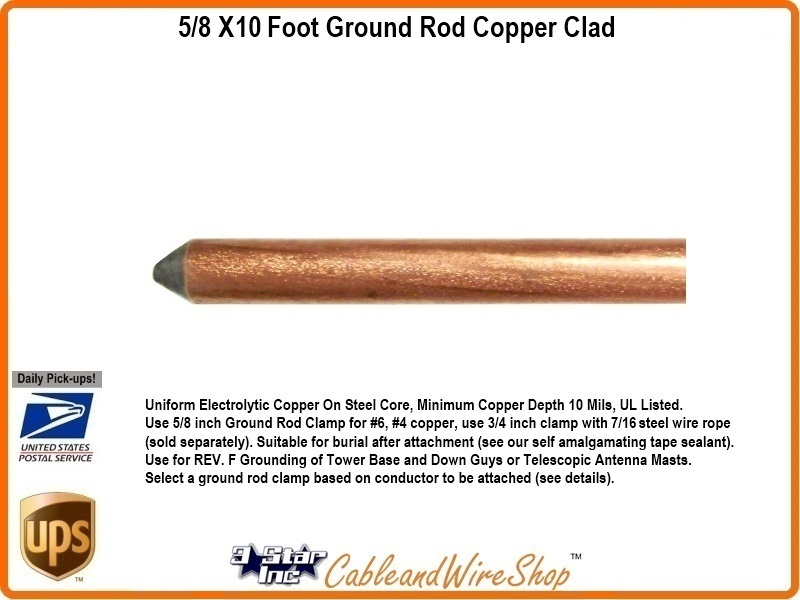 Use 5/8 inch Ground Rod Clamp for #6, #4 copper, use 3/4 inch clamp with steel wire rope (sold separately). Suitable for burial after attachment (see our self amalgamating tape sealant). Use for REV. F Grounding of Tower Base and Down Guys or Telescopic Antenna Masts. Select a ground rod clamp based on conductor to be attached (see details). Note: REV. F Tower Grounding kits are based on 8 foot ground rod use, REV. G Tower Grounding Kits use 10 foot ground rods (that can only be shipped LTL Freight). REV. F Tower Grounding Kits use #4 Solid or Stranded Copper (use a regular 5/8 inch ground rod clamp), whereas REV. G Tower Grounding Kits rely on 7/16 inch Galvanized Steel Wire Rope (select the 3/4 inch ground rod clamp we sell here).